Flow is a traffic visualization like none you’ve ever seen. It’s beautiful, it’s fast, and it’s incredibly intuitive. Instead of a line graph or a table, you get a diagram of the actual paths people take as they browse your site. Follow your users every step of the way – from the homepage, through signup, and each page they hit as they use your product. You can figure out which pages are working and which ones aren’t. 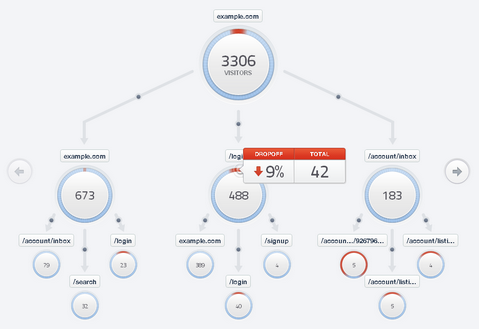 Flow shows you exactly how many people leave from each page of your site. It takes less than a second for a user to show up in Flow. If you’re launching a brand-new site, it’s the fastest way to see what’s happening. Looks more intuitive than GA.